The Plotter Kill Nature Preserve is located in Rotterdam, in the Capital Region of New York. It contains three major waterfalls - two on the Plotter Kill, one on a tributary of the Plotter Kill - as well as numerous cascades, an impressive gorge, and nice trails. It is similar to the Indian Kill Nature Preserve in that is surprisingly beautiful for the area. It is difficult to decide which is the most direct way to get to the preserve. Its northern boundary does touch the New York State Thruway (I-90), but obviously there is no access to the preserve there. There are two parking areas/trailheads. Both are reached by NYS 159, also known as Mariaville Road. To reach route 159, either pick it up at its start, in Schenectady, or take Gordon Road (Schenectady County Route 56) from the Rotterdam Square Mall area. Traveling east to west, the first parking area is reached by turning down Coplon Road. At the second, there is a sign for the preserve. This is the parking area that should be used if you just wish to see the three major waterfalls. From here, there are several ways to get to the waterfalls, but the best is probably to follow the red trail. This trail forks left immediately past the start, then follows a slight downgrade to the Plotter Kill. The trail is usually muddy. Here, continue to follow the red trail, crossing the Kill on a bridge, bearing right, and arriving at the first waterfall after about 10 minutes from the parking area. 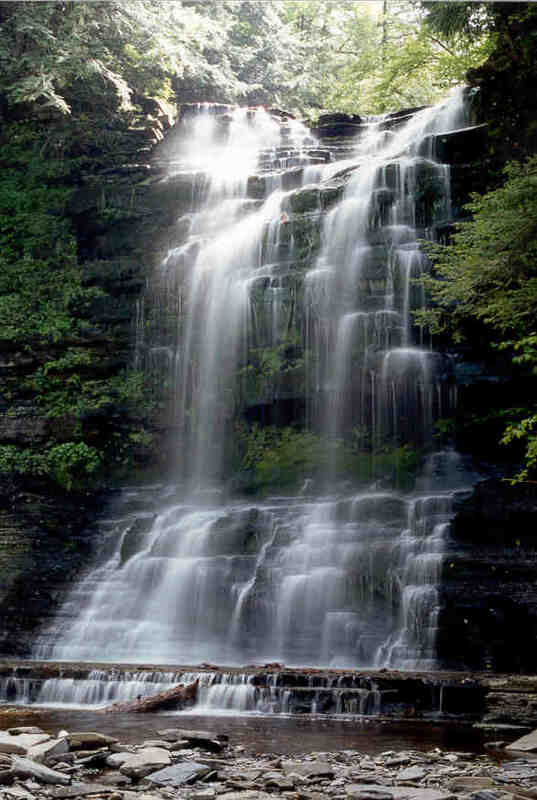 The uppermost waterfall on the Plotter Kill is about 60 feet high. Higher cliffs surround the falls on both sides. There is a side trail that goes to the top of the falls, and a very rough one to its base. The falls definitely looks the best from the base, but it is very difficult to get there. The ground is very loose, eroded, and gravelly. If you attempt to go to the base, be careful, plan on getting dirty, and keep in mind that the return trip up won't be any easier. The lower waterfall on the Plotter Kill is maybe slightly less high than the upper, perhaps 50 feet. It has a very similar appearence, with the addition of a little shelf cascade at the bottom of the falls. The picture on this page is of this falls. The easiest way to get to the lower falls from the base of the upper falls is to follow right along side the stream. Usually, the water is low enough so that this is not a problem. However, it is again difficult to go down to the base, and to climb back up. Keep this in mind. I have not yet visited the third waterfall, or much of the rest of the Preserve. As soon as I do, this page will be updated with more information. Both falls are surprisingly beautiful, unexpected in this area. Since the Preserve is so close to a populated area, expect to see garbage and grafitti on the rocks. This is not so bad as to spoil the experience, however. Finally, try to visit in the spring, or right after a thunderstorm, as the Plotter Kill does not usually hold a significant amount of water. Taking a look at a map of the Preserve might help to clear up some confusion.